Happy New Year to the PlanetCatfish.com faithful! The year 2013 is off to a flyer with a splendid "from river to reproduction" article, the type of which I am especially fond of reading in relation to any particular species. The original German article ("Und es klappt doch — Pseudolithoxus dumus (L244)"), or, "It goes nevertheless — Pseudolithoxus dumus (L244) was translated into English by its author, Elko Kinlechner, with minimal editing from me. Over now to Elko, to describe his lengthly involvement with this featured species. 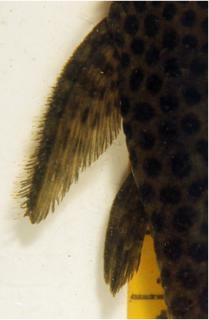 Pseudolithoxus are most readily distinguished from other plecos by their extremely long pectoral fins. 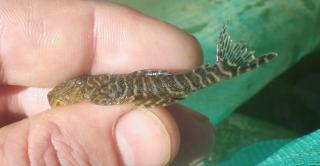 On the basis of this feature they are also called flyer plecos. Much time has passed between their initial introductions as l-numbers by DATZ magazine in 1996 and the first breeding success one of the species in genus Pseudolithoxus. At the end of 2011 I was delighted to discover fry after much futile effort. 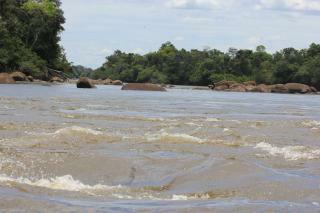 The Rio Orinoco near Santa Barbara. Pseudolithoxus anthrax is the type species of the genus. Considerably later in 2011 Lujan & Birindelli described another attractive species and they placed it in the genus Pseudolithoxus naming it P. kelsorum (L189). In addition, three undescribed congeners are known: P. sp. L328, P. sp. L385 and Pseudolithoxus sp. "Rio Guapore". Pseudolithoxus anthrax, P. dumus and P. tigris are the best known in the aquarium hobby as these three species are regularly exported from Venezuela. P. kelsorum is rare in the trade. The first import of P. nicoi to Germany was few months ago (near the end of 2012). Pseudolithoxus anthrax, P. tigris and P. dumus we find mainly in the upper Orinoco basin, especially in the Rio Ventuari. This river is mostly clear water but can be variously clear water mixed with black water or clear water mixed with white water. 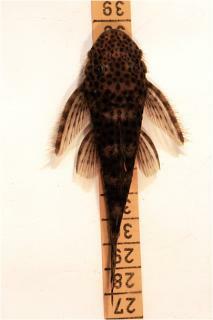 P. nicoi comes from the black waters in the vicinity of the Rio Casiquare and the Rio Atabapo. About four years ago I was able to buy a group (six plecos, most likely three males and females) of Pseudolithoxus dumus in Welsladen Chemnitz. 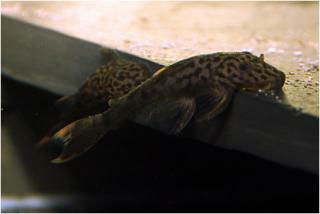 I kept only these plecos in an aquarium that is 100 cm x 40 cm x 40 cm (160 L) [or approximately 39" x 16" x 16" (35 imp. gal.)]. This aquarium has an external JBL Eco filter and an internal Eheim 2212 filter. I heat the aquarium with a 100 watt heater. The tank has no plants, therefore it is possible to dispense with lighting. The day-night cycle is ensured by the incidental daylight. For this step-up I used catfish caves and slate, and fine, blunt gravel. 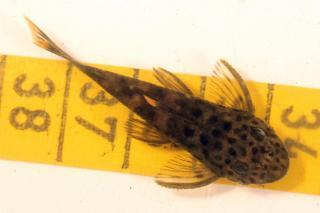 I soon noticed that the Pseudolithoxus are very similar to the behaviour of Zonancistrus brachyurus (L 168), but these Pseudolithoxus live very much more withdrawn. Slate pipes instead of catfish caves! 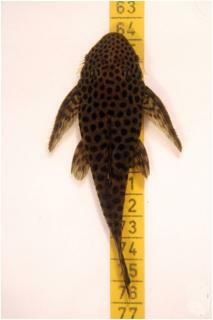 My experience with Zonancistrus brachyurus is that they avoid standard single entrance pleco caves and prefer open ended slate pipes. 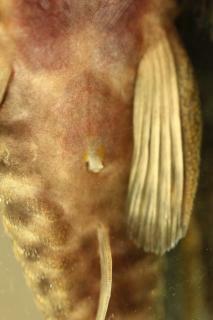 Also the breeding male Zonancistrus chose such a "pipe". I decided, because of the similarity of behaviour with Zonancistrus, and even in a Pseudolithoxus aquarium, to replace standard pleco caves with such slate pipes. 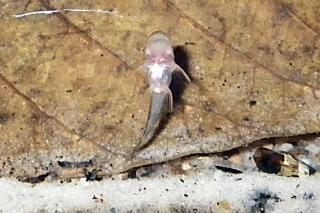 Additionally, I noticed that the Pseudolithoxus tried to dig holes in the gravel. 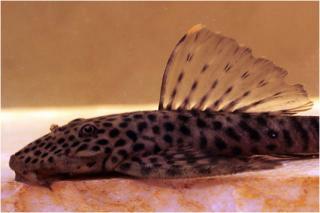 Thus, the plan for the redesign of the Pseudolithoxus colony was decided; sand instead of gravel and slate pipes instead of regular pleco caves. In terms of water changes, I used mostly RO water or rain water that was supplemented with tap water to achieve the desired water parameters. In most cases I perform a water change after one or two weeks. Occasionally I waited a little longer for purpose of breeding stimulation. On that subject, during the following years I tried to stimulate the animals to spawn by, in particular, changing various water parameters. During this time, these parameters varied in the aquarium in the areas and valuesdetailed in the table below. Parenthesis are used to show minimum and maximum ranges. 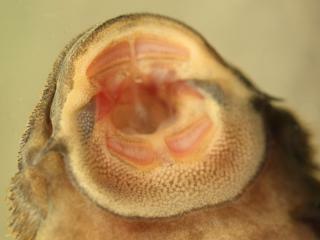 A look into the mouth of Pseudolithoxus dumus reveals that it is omnivorous, taking mainly vegetarian foods, however, it is not averse to carnivore food either. 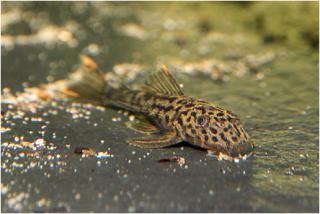 I feed mainly DuplaRin G. as well as other pleco-chips from JBL and Tetra for variety. Frozen food was barely taken, vegetables are rejected. 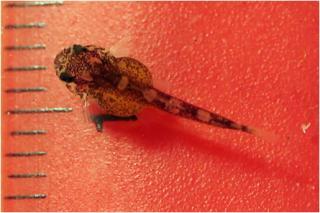 Gender is easily distinguishable because adult Pseudolithoxus dumus show several clear sexual dimorphisms. 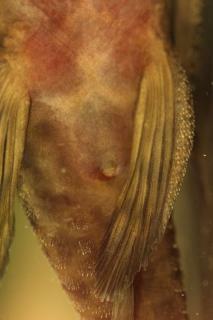 From the dorsal view males appear much slimmer; the odontodes on the first ray of pectoral-fin are much more numerous, thicker and longer. 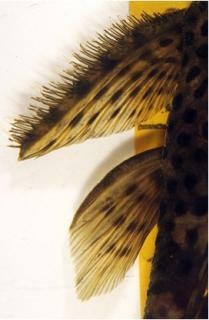 To a trained eye, the ventral fin appears slightly larger. Furthermore, the distinction based on the genital papilla, which appears in the female more tubular, is also possible. After four years of intensive efforts to reproduce Pseudolithoxus dumus, I had exhausted all realizable ideas in relation to probably all of these factors. In resignation, I changed the aquarium water with only with tap water on and only on occasion. About six months later, one Sunday evening, I examined the aquarium. 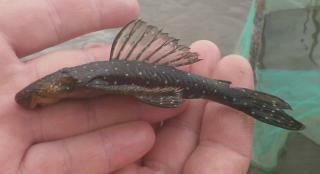 There I discovered small Pseudolithoxus. Its yolk sac was completely consumed, therefore it had to be several days old. 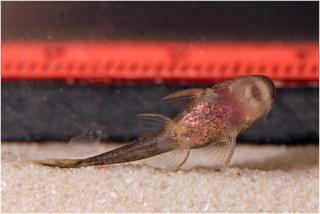 Based on larvae discovered a few weeks later from a following hatch and their speed to grow up, the initially discovered fry must been about four weeks old. Based on my notes, I had determined that about a fortnight before the initial fry was a change of aquarium water with RO water. Considering the fact that I had been doing water changes with tap water for a long time, the pH had fallen relatively quickly within the 14 days between water change and spawn. 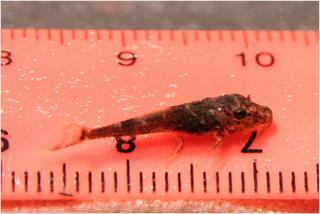 Over around two and a half months came five spawns, each of which produced more than 20 fry. The rearing of the fry was very easy. The fry graze around the aquarium glass and aquarium equipment on algae and detritus. 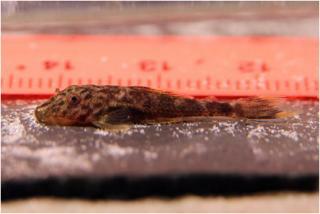 Soon the fry accept sera PlecoChips and DuplaRin G. Up to a size of four to five centimetres. The fry they grew rapidly within a few weeks but, thereafter, the growth was much slower. Unfortunately it was not possible to observe the male during breeding. In the hope of taking pictures of the male and the egg clutch, I have probably prevented a spawn. If you approach the aquarium, the adult Pseudolithoxus normally flee to the farthest corner. But this evening the largest male was resolutely clamped in his slate column. Unfortunately, also after I turned the cave, I saw no eggs. The next morning I saw that the slate column was abandonded. 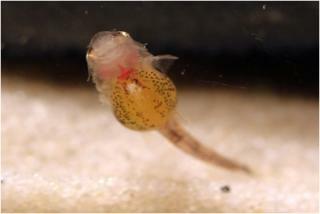 A chronological presentation of fry and juvenile development is shown in the images below. 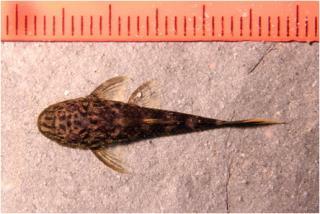 Pseudolithoxus dumus I got to know as a very secretive species. It's a species for fans of empty looking aquaria. Nevertheless, Pseudolithoxus dumus are not an everyday species in the fishkeeping world and it is a pleasure to study the animals. It is especially nice if it is possible that a species of which was considered hard to breed, now is bred. 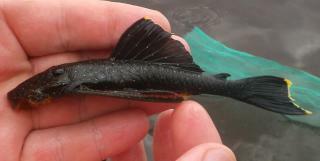 This gives hope and inspiration to many new fishkeeping challenges! Type Locality Río Orinoco, backwater behind sand playa ca. 0.5 hr upstream from Isla Temblador, 3°04'N, 66°28'W, Estado Amazonas, Venezuela. Breeding The first species in the genus to be bred in captivity (2011). Is a square pipe spawner, preferring open ended narrow spaces to a closed-end cave. 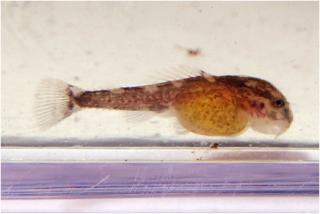 Male guards egg clutch, free swimming fry are straightforward to feed on prepared foods as soon as their yolk sac is completely consumed.